Post Hill Press, 9781642930733, 208pp. De Oppresso Liber—Free yourself with the Green Beret’s A-Team methods of syncing mind, body, and spirit to become all you want to be. War has a way of shooting holes in your best-laid plans. Sgt. 1st Class Gregory Stube (Ret.) suffered life-changing wounds during the battle of Operation Medusa in Afghanistan in 2006, but using the Green Beret methods he learned in the Special Forces, Stube knew he could conquer anything. Service in the elite A-Team teaches you to come up with smart, well-researched, and flexible battle plans for completing the mission—every mission. Even when that mission is to spend an arduous year in a hospital recovering from being blown up, badly burned, and shot multiple times. 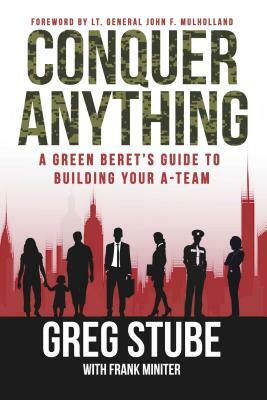 Greg shares the leadership principles and values he learned as a member of an A-Team and teaches us how to apply Special Forces strategies to our personal and business lives. Conquer Anything is a Special Forces book, but even more than that it is a leadership book designed to help each of us achieve the highest goals possible in our professional and private lives. “The greatest leaders I know lead by example. They are role models who adhere to standards they set for others and never ask more of them than they demand of themselves. Great leaders don’t just “manage” or “motivate.” They inspire courage, tenacity, perseverance, resilience, and commitment in all who work with them. Greg Stube is such a leader—and an American Hero. SFC Gregory A. Stube (ret.) is from Covington, Tennessee. He spent 19 of his 23 years in the U.S. Army as a member of the Green Berets. He was very seriously wounded during Operation Medusa in Afghanistan, September 2006. He was soon called a “miracle” by physicians for having survived and recovered so well. He credits his A-Team and his faith with his survival and recovery. He then became the Green Beret’s first official spokesperson and has since moved on to leadership training and teambuilding, and speaking about leadership and character. Frank Miniter is the author of The Ultimate Man’s Survival Guide: Recovering the Lost Art of Manhood, a New York Timesbestseller. He is also the author of Kill Big Brother, a thriller on how we can stay safe and keep our freedom in this age of terror, as well as This Will Make a Man of You—One Man’s Search for Hemingway and Manhood in a Changing World,Saving the Bill of Rights, and The Future of the Gun. Miniter is a Forbes Contributor, a contributing writer to Outdoor Life magazine, and a field editor for American Hunter. Frank writes for other publications from Boys’ Life to National Review.